SALINAS, CA (Nov. 7, 2016) – Church Brothers Farms, a leading grower/processor/shipper of more than 500 fresh vegetable SKUs, rebuilt its website to offer all site visitors new features, content and an enhanced experience. The company has been working on the project for almost a year; the new, fully responsive site has over 100 product pages that coordinate with its full product line offering. “We strengthened our SEO and navigation design to make it easier for the search engines and site visitors to find relevant content,” said Kori Tuggle, vice president of marketing. Other new functionalities include the ability to view the site in three languages Spanish, French and English; all company social media channels are combined to view on one social feed page; and a home page video produced by Chuck Church that introduces the company in 30 seconds. For industry visitors to the site, there is a growing region and farming section; a sustainability section; food safety resource library, a company logo download section; and UPC codes/GTIN codes organized into one page for retail items. The new site also has now built-in, real time analytic reporting. 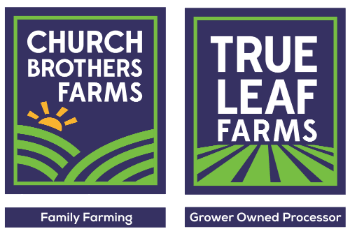 Church Brothers Farms will continue to develop content for the site, with priority given to videos and the other most used sections of the site.